At Pine Grove Community you can enjoy cooking in a spacious, tastefully decorated common country kitchen. Modern refrigerator freezer, stove, microwave, dishwasher, toaster, coffeemaker and cupboards amply stocked with cookware, utensils and dishes are available. Shaker style kitchen table is situated before a large picture window overlooking fields, gardens and woodlands. 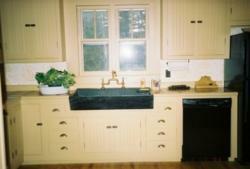 A restored 42 inch soapstone kitchen sink makes food preparation and clean-up reminiscent of yesteryear. 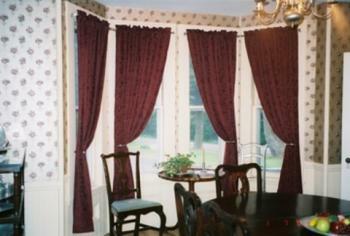 Alternative dining option is available in the formal dining room with seating up to ten people. 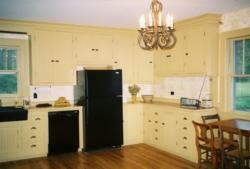 China cabinet with full set of china, silverware, glassware, server, trays and linen are accessible for residents use. 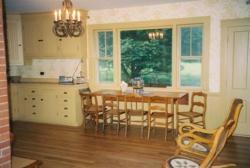 A bay window in dining room allows a view of the front yard landscaping, flower gardens, barn and country road.